So wrote Queen Victoria in her diary, while visiting Inverlochy Castle for a week`s holiday, relaxing in the beautiful and tranquil gardens to enjoy sketching and painting. This was in September 1873, one hundred years before Inverlochy was transformed from a private country house estate into a luxury 5 star hotel. The bedroom in which she stayed is now the Honeymoon Suite, with four poster bed, draped in shades of soft pink and peach, offering the most perfect and peaceful setting - not least the window views of snow-capped mountains and the loch below. It is not surprising to learn that Inverlochy was voted Romantic Hotel of 1997, and needless to say, continues to be a "romantic spot", year after year. 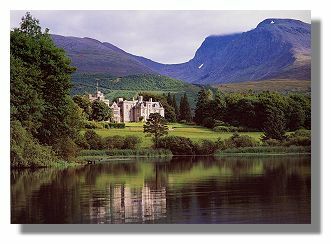 Inverlochy Castle is just three miles north of Fort William on the north west coast, situated amongst breathtaking scenery at the foothills of Ben Nevis, the highest mountain in Scotland. As soon as you enter the impressive Great Hall, with its blue frescoed ceiling and crystal chandeliers, or walk through to the elegant drawing room you feel you have drifted back a few decades to an era of old fashioned sophistication and refined lifestyle. Here you will find a calming and tranquil ambience, where tradition and service dictate an unhurried, relaxed pace of life - very similar perhaps to the grand house parties entertaining family guests in the years gone by. During the 19th century it was fashionable as well as financially astute for wealthy aristocracy and businessmen from Lowland Scotland or England to purchase land and property in the Scottish Highlands. 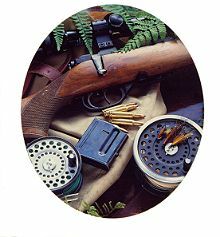 This offered the family a country farm estate, a summer residence for house parties, stalking deer, grouse shooting and fishing and also great social prestige. In 1840 the vast expanse of farmland, crofts, moors, mountains and rivers, that constituted the Inverlochy Estates covered more than 42,000 acres. Owned by the Marquis of Huntly, rising debts turned to bankruptcy and the family trust was forced to sell. A wealthy London lawyer, the Hon. Robert Scarlett, son of Baron Abinger, heard about the property and, with his young son, William, travelled north to Fort William. The journey took a week but thankfully after several days exploring the estate he was so impressed with the beautiful setting as well as the investment potential, that they returned to London and, with the support of his father, they agreed to purchase Inverlochy. The selling price was £75,150 (though a fortune in those days), as well as an additional £600 for the salmon fishing rights. For many years thereafter the family home for summer holidays was a country house at Torlundie, the main farmstead of the estate. When William succeeded his father as Baron Abinger in 1861 he had grown so attached to life in the Scottish Highlands that he decided to leave the old family seat in Surrey and build a grand mansion there. The next decade saw the construction of their magnificent home, Inverlochy Castle. In 1870 William, with his young American wife, Helen moved in and over the years their four children were born and grew up at the castle. In true aristocratic style the family estate passed down the family line, from father to son. Tragically the fourth Baron Aginger, James died suddenly in 1903, aged just 32 years old, without an immediate heir. But the Scarlett family continued ownership through a cousin, Captain Leopold Scarlett. Eventually in 1944, one hundred years after Robert Scarlett first visited Inverlochy, the property and land was sold to Mr. Joseph Hobbs, a Canadian entrepreneur. Hobbs was not a stranger to the area, and already the owner of the Glen Nevis Distillery and later the Ben Nevis Distillery. He soon invested a great deal more to improve and develop the farm lands on the estate. His vision was to create a cattle ranch in true wild west fashion. Irish Heifers and Aberdeen Angus bulls were purchased and in time the Great Glen Cattle Ranch was completed. This popular venture as well as pioneering work at the distillery, Old Joe as he was called locally was well respected as an employer and boss of the Inverlochy Estates. In 1963 Joe Hobbs jun, took over as owner on the death of his father. With his Danish wife Grete they decided to transform their Highland home into a country house hotel. While maintaining the grandeur and design of the original features, certain renovation work was essential, providing fire escapes and increasing the number of bedrooms from ten to seventeen, all of which were redecorated and furnished. Inverlochy Castle received its first guests in 1969 and within two years the investment had certainly paid off with the honour of being given the prestigious Egon Ronay Hotel of the year award. Next page > Inverlochy Castle Today > Page 1, 2, 3, 4. Or return to the Index of Great Places to Stay in Scotland.